This has nothing to do with quilting, but I thought I would share anyway. Back in April my daughter-in-law invited me to join her in a metal sculpting class. She said it was a 4-week course, that we would attend class every Wednesday from 6-9 p.m., that the instructor was a renown sculptor/artist, and at the end we would have a finished metal sculpture. Sounded like fun, so I said, "Sign me up." In the beginning you provide a sketch of what you want to make. 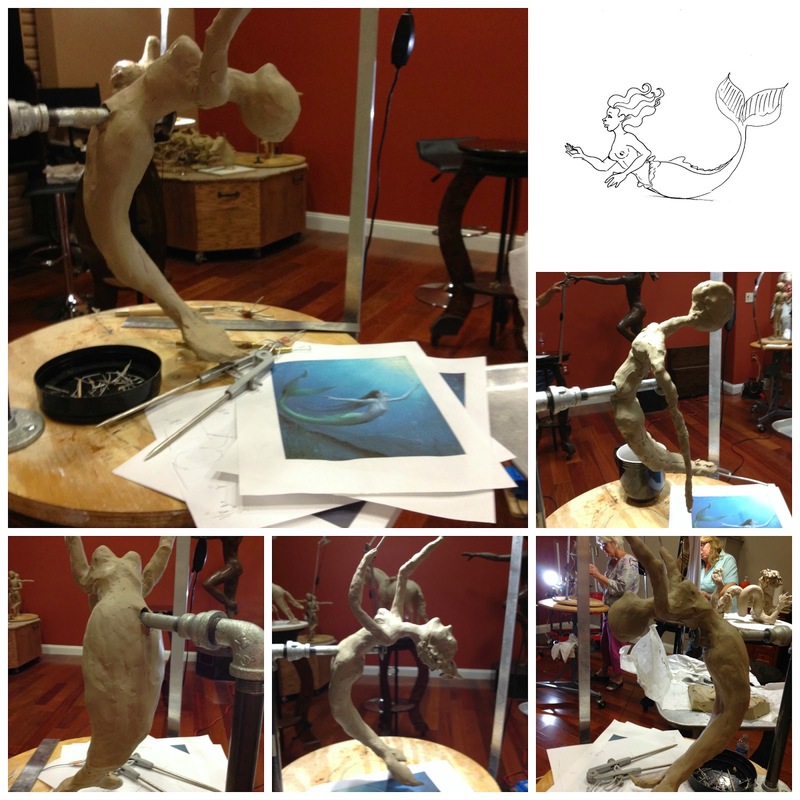 For my project I chose to do a mermaid. I thought she would be pretty easy because she didn't have legs, and since a mermaid is fantasy, she didn't have to look perfectly human. I searched the Internet for pictures of mermaids and printed off the ones I liked the best. You can see my favorite on my work table. A wire form is made and you begin adding clay. We use an oil-based clay that never hardens. You can heat it up in the microwave to make it easier to work with, especially when you're just adding clay to the wire form. It takes a lot of clay to fill the form. My piece is not really that big, maybe 15 inches. There is a skeleton in class that is used to get the body measurements to scale. Pins are stuck in the clay at points like elbows and knees. You can see the pin in my mermaid's elbow. She is being done at a scale of 1/8. Most everyone else enjoys a glass of wine while they sculpt, but I like my coffee. Everyone tells me I work fast. Maybe it's got something to do with the caffeine. I needed a lot of help with the facial features. Dwight is an excellent artist and a really good teacher. He makes suggestions, then lets you go for it. Once the hair was added she started looking like a real mermaid to me. Dwight added some wires to her head so that her hair could trail behind her like it might in water. The messy clumps of clay bits were smoothed into long wavy tresses with my thumb. To make her look like she is floating in the water, the barest structure will be placed under her. Near her tail fins I made long strands of seaweed coming up from the base and curving around her backside. She gets ears, or the equivalent of what I thought a mermaid's ears might look like. Her face is smoothed out into a more serene look. And she's done. Her next step is to be made into bronze. That's a really expensive process, so I don't know when or if that will happen. What was supposed to be 4 weeks, turned out to be more like 4 months, but I had great time learning all about sculpting. I must say I am impressed with her. Our instructor Dwight Dreyer is amazing and an awesome teacher.